The Wayne Dry Heat Sterilizer is a fine precision instrument utilizing all the improved techniques developed in more than 20 years experience in the designing, engineering and manufacturing of dry heat sterilizers. Only the best hospital grade materials and scientifically proven components are used and rigid quality control during manufacture assures you of an instrument that will perform satisfactorily for many years. Both models operate at 320 - 360 F (160 - 180 C) automatically. Simply place unsterile items in trays, (plus small needle tray), and set timer. Plugs into 115V AC current. (Please inquire about other voltages). 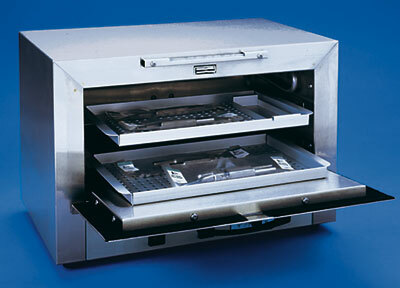 The Wayne Dry Heat Sterilizer is inexpensive to buy and inexpensive to operate. It is now common knowledge that there are forms of bacteria which are not destroyed by boiling or chemical sterilization. Experience has shown that exposure to concentrated heat is one of the most satisfactory methods of destroying these bacteria. Textbooks recommend that dry heat at 150 C for one half hour is effective. The Wayne dry heat sterilizers generate heat from 160 to 180 C (320 to 360 F), temperatures more than adequate to destroy bacterial life, and there is no problem from grease or protein. Prior to the development of dry heat instruments, the only satisfactory sterilization was achieved by steam under pressure in the autoclave. While the autoclave was effective against the bacteria, the moist steam has an undesirable effect on sharp cutting edges. Also, needles developed oxidation caused by moisture. Exposure to the galvanic action which is increased by the high temperatures in the autoclave causes all metal instruments to corrode more readily. It is impossible to damage even your sharpest and most delicate instruments with dry heat when used properly. During their manufacture, the instruments are tempered at much higher temperatures than they will ever be exposed to in a dry heat sterilizer.